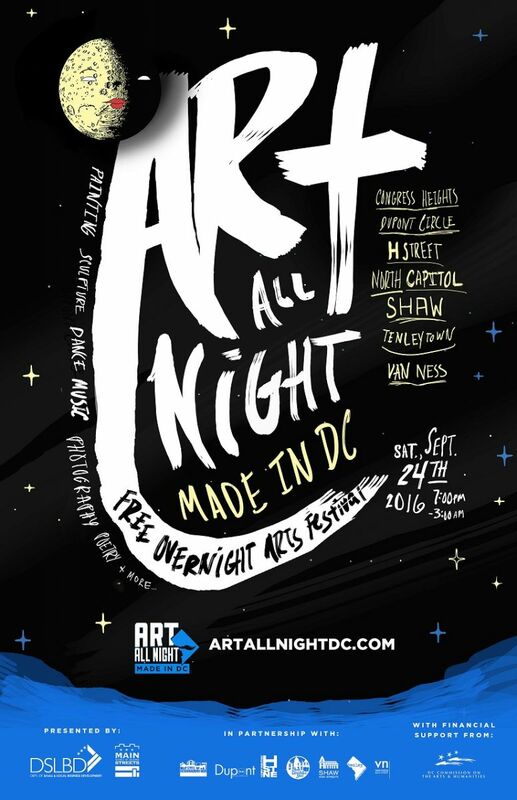 Starting on Saturday, September 24, 2016, at 7:00 PM until 3:00 AM the following morning, Art All Night: Made in DC, the city’s free overnight arts festival, will span seven DC Main Streets neighborhoods, bringing visual and performing arts, including painting, photography, music, dance, theater, film, sculpture, crafts, fashion, poetry, and much more to indoor and outdoor public and private spaces, including businesses. The festival will feature District of Columbia artists and collectives only, in celebration of the Made in DC initiative. The only exceptions will be selected international artists, by special invitation. 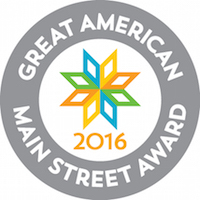 The festival is presented by the DC Department of Small and Local Business Development in partnership with Destination Congress Heights, Dupont Circle Main Streets, H Street Main Street, North Capitol Main Street, Shaw Main Streets, Tenleytown Main Street and Van Ness Main Street, with financial support from the DC Commission on the Arts and Humanities. A ‘pre-party’ sponsored by JBG will begin at 5:00 PM on the 1900-2100 blocks of 8th Street, NW, in Shaw, with over 25 aerialists, jugglers, gymnasts, and other performers from the Nuit Cirque troupe, in addition to art installations and music in businesses along those blocks. Highlights of the festival in Shaw will include an outdoor Glow Dance party featuring a three-story 1960s style high psychedelic liquid light show; a new mural featuring the neighborhood's celebrated music history; outdoor musical and dance performances with Chinese, French, Mexican, and Thai themes; and a return of the festival to the Wonder Bread Factory at 641 Street, NW, where it all started in 2011, with excitement on two floors, all night long. Visit www.artallnightdc.com and follow on Facebook, Twitter and Instagram for updates on artists, performance schedules, contests, and special offers from sponsors, partners, and participating businesses. And download the ArtAllNightDC mobile app on the App Store or Google Play Store for full programming information, maps, and last minute additions.